"Wonk factor". Love it. Have a use for that phrase often! Ah. The nervousness of joining new groups. I find it awful and exciting all at the same time. Thanks for the tip. I may have to join the nervousness and excitement. Thanks for the linkage, Mama. Now, your wonky pincushion. So. Cute. You are! And Sentimental, yes? I bet you look at that some days now, when you've whipped up something special for one of the owlets, & smile, thinking "And I was so nervous then!". I love that it's a good size, nothing worse than trying to find some free space in a teeny pincushion! Thanks for playing along again this week, I am enjoying this all much more the second time around...! 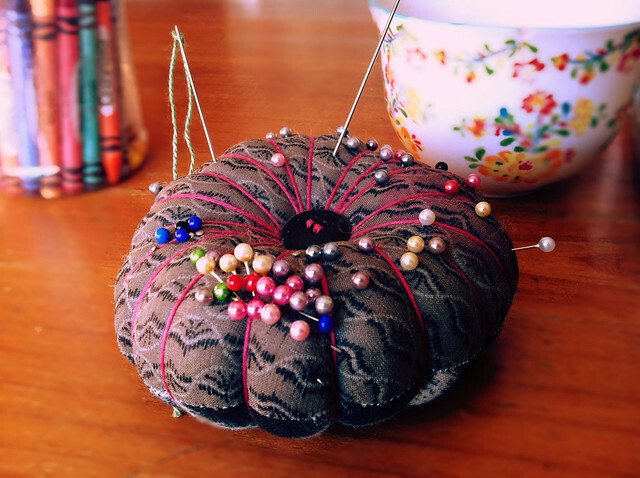 Nothing really beats a wonky pincushion , just lovely ! what a great back story! glad it's still serving you well! Love the fabric and I enjoyed reading about the story behind your pincushion too. We have similar pin cushions and I also wrote about my daughter playing with the pins. Yours is cooler though, because you made it yourself. Wonk factor wins! Oh what a great little pin-cushion!love the red thread and fab fabric.